Lancaster’s newest purpose built student block is now open for business, despite its building contractor going into administration half way through its construction. The £7m Cityblock Penny Street opened in time for this year’s student intake in September, catering for students from Lancaster University and the University of Cumbria. Cityblock maintenance manager Michael Cresswell, CEO Trevor Bargh, and lettings manager Rachel Ecclestone. It is the fifth student development from Lancaster based Cityblock, built on the site of the former Squires Pool Hall. Space has also been created for retail units on the ground floor of the building, which are expected to open in the coming months. Midway through construction, contractors Titan went into administration, leaving the development part finished and 70 students at risk of moving to Lancaster with nowhere to stay. But Cityblock said that thanks to the support of local suppliers and contractors, the development was completed in time. CityBlock’s operations director, Alison Bargh, said: “We have a longstanding history in Lancaster, where we established CityBlock 15 years ago. We have an in-depth understanding of the landscape of Lancaster and know that this new development will benefit the city massively. “CityBlock has a proven track record of providing top quality purpose built student accommodation, both in Lancaster and across the UK, and our Penny Street development is no different. We frequently ask students what they want and need from their student accommodation and Penny Street reflects this, with the development receiving the sought after ANUK accreditation this week. The building features studio apartments and shared spaces with stunning views across the city. Cityblock boss Trevor Bargh said that particular attention had been paid to the “student experience” with 24 hour security, weekly cleaning, energy efficiency and natural lighting all important parts of the development. CityBlock won ‘Best Moving in Experience’ in the 2017 National Student Housing Awards. But the company is currently in a planning wrangle over conditions imposed on its Gillows building development. The issues focus on whether noise from Lancaster University Student Union (LUSU) nightclub The Sugarhouse would affect students living in the North Road building. 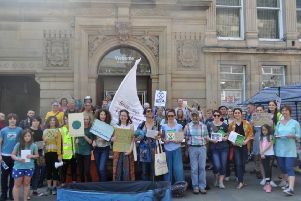 Mr Bargh said that the company would continue to appeal against Lancaster City Council’s decisions.